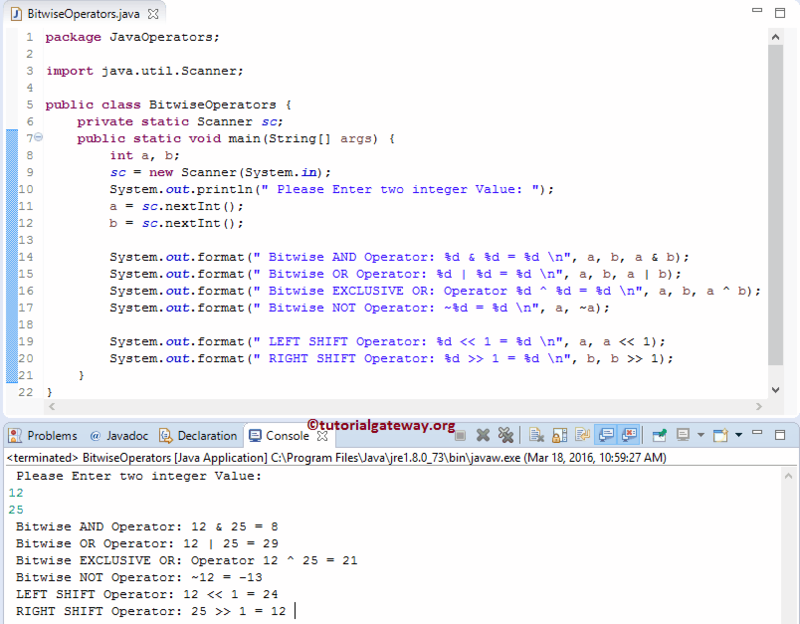 The Bitwise operators in Java programming are used to perform bit operations. All the decimal values will be converted into binary values (sequence of bits i.e 0100, 1100, 1000, 1001 etc). The Java Bitwise Operators will work on these bits such as shifting them left to right or converting bit value from 0 to 1 etc. This example helps you to understand the Java Bitwsie Operators practically. This Java program allows the user to enter two integer variables a and b and we are going to use these two variables to show you various Bitwise operators in Java Programming Language. In this Java bitwise operator example, the following statement will ask the user to enter integer values a, b and we are going to assign the user input values to respected variables. In this Java bitwise operator example ,We assigned the values as a = 12 and b = 25. The binary form of 12 = 00001100 and 25 = 00011001.